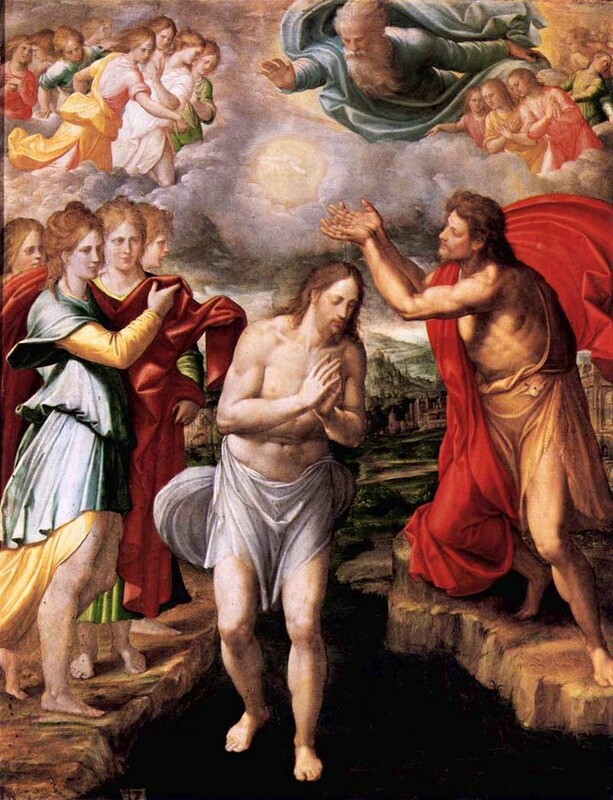 As we come to the close of the Christmas season and begin the ordinary time in this liturgical year, the Church pauses on this Sunday and draws our attention to an important moment of revelation of the person of Jesus Christ, a moment that took place when Jesus willingly submitted himself to be baptised by St John the Baptist at the River Jordan. Pope Emeritus Benedict once said that the “joy arising from the celebration of Christmas finds its completion today in the Feast of the Baptism of the Lord.” To this joy is added another reason for those of us who are gathered here: in the Sacrament of Baptism that will soon be administered to these infants, who will be adopted as Children of God and made into living members of Church, and we cannot help but rejoice. Today, you parents have taken an important step in deciding to have your children baptised. Why isn't it sufficient for discipleship to know the teachings of Jesus, to know the Christian values? Why is it necessary to be baptised? Many would of course answer in the negative. Living a good life according to one’s conscience, abiding by the golden rule of “doing to others what you wish others to do to you”, and avoiding evil, seems sufficient in today’s society that sees no need for God or religion. The question may also be asked of our Lord’s decision to submit himself to the baptism for the repentance of sins administered by St John. Was this necessary? If Jesus is truly the Holy One of God, the sinless one, would he be in need of repentance or conversion? The action seems utterly pointless and superfluous. But it is here that we recognise the intimate connection between what took place on Christmas Day and what takes place today in the gospel. In both stories, we encounter the path of abasement and humility that the Son of God freely chose in order to adhere to the plan of the Father, to be obedient to His loving will, even to the offering His Life as a sacrifice on the cross for the salvation of many. Our Lord Jesus, the sinless one, unites himself with the condition of humanity, a condition that was initially planned to be flawless, but now marred by sin. Jesus shows solidarity with us, with our effort to convert, to leave behind our old selves. He joins the line of penitents and sinners queuing up for what was the ancient equivalent of a public confession. In this, Jesus shows us the true meaning of mercy and compassion. The Latin root for the word compassion indicates “suffering with”, and Jesus chooses now to subject himself to the ignoble humiliation of asking for forgiveness. What happens at the moment when Jesus was baptised by John? In the face of this humble and free act of love on the part of Jesus, the Holy Trinity was manifested. The Father speaks, the Spirit is manifested and the Son is revealed. The destructive waters of chaos which pre-existed creation, the Deluge that destroyed the world, the returning waters of the Red Sea that annihilated the army of Pharaoh, now becomes the source of a new creation, the origin of life. In this very act of God who chooses to humble Himself by assuming our human condition, sin and Satan is defeated, new life is reborn. My dear parents, what happens in Baptism, which will soon be administered to your children? What happens is this: they will be united in a profound way and forever with Jesus, who chooses to unite Himself with all of us at His Baptism. These children will be immersed in the mystery of His power of recreation to be reborn to new life. When they emerge from the waters of baptism, they would no longer just be your children. They will be reborn as children of God, brothers of our Lord Jesus and will be able to turn to God and call upon Him with full trust and confidence, “Father!” The pleasure of God would be pronounced over them. The water with which these children will be baptised will be accompanied with the words, “I baptise you in the name of the Father and of the Son and of the Holy Spirit.” Your children will be inserted into the name of the Trinity. Pope Emeritus Benedict speaks of it as an interpenetration of the being of God and our being, just as in marriage, for example, two persons become one flesh, become one single new reality, with a single new name. This thought is staggering to say the least. As incredible as it sounds, what happens in baptism is that we become inserted into the name of God, so that we belong to this name and his name becomes our name. Every time when we make the sign of the cross in the name of the Trinity, we remember not only our baptism but the truth that God is no longer very distant from us, he is not a reality to be discussed – whether he exists or not – but we are in God and God is in us. We will no longer be merely defined by our parentage or heritage or culture, we will be defined by God Himself. But being children of God they are also inserted into the Body of Christ. Being immersed in God I am united with all others, I am united with my brothers and sisters, because all the others are in God and if I am drawn out of my isolation, if I am immersed in God, I am immersed in communion with others. Being baptised is never a solitary act of “me,” but is always necessarily a being united with all the others, a being in unity and solidarity with the whole body of Christ, with the whole community of his brothers and sisters. This fact that Baptism inserts me into community breaks my isolation. There can be no Christ without the Body, and there can be no Body without Christ as its Head. These children would now be made living members of the Church. If baptism is necessary for their salvation, if Christ is necessary for their salvation, the Church must also be necessary for their salvation. You cannot choose one without the other. And the final question that is always raised is: “But can we impose on a child what religion he wants to live or not? Shouldn't we leave that decision to the child?” Many may argue that infant baptism robs children of the freedom to choose their path of life. And yet parents make so many other decisions on behalf of their children without relying on this flimsy argument. Today freedom and Christian life, the observance of the commandments of God, move in opposite directions. Being Christian is thought to be a sort of slavery; freedom is emancipation from the Christian faith, emancipation – in the final analysis – from God. But the opposite is true. Christianity and the gift of baptism is what gives our children true freedom. Christ has come to free us from slavery to the world, to sin, and to the power of Satan. It is in baptism that we celebrate that very victory. So, is it necessary for your children to be baptised? Is it depriving them of their freedom to choose? The answer is a definite ‘Yes’ to the first question and a ‘No’ to the second. Life itself is given to us without our being able to choose whether we want to live or not. No one is asked: “do you want to be born or not?” Life itself is necessarily given to us without previous consent. Likewise the same must be said of baptism, which promises eternal life. Can we honestly say that we wish to give our children the right to choose to be saved or not, to receive eternal life or not? The answer of loving parents would obviously be to always choose salvation and eternal life. Baptism is guarantee of that salvation and eternal life and thus must always be chosen as you have chosen to give birth to these children. Baptism is the doorway to salvation, it is now your duty as parents and godparents that they should walk through it and pass through the corridor of life in order that they may reach their final goal – communion with God in Paradise forever.